Light weight and easy care. 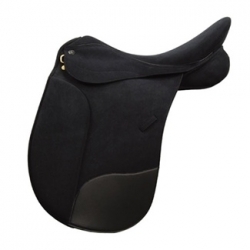 Thoughtfully designed for your optimal performance and horse&apos;s comfort. Hose Off Saddle To Clean. Even The Soft, Suede Seat Can Be Hosed Off! Light Weight And Easy Care. Thoughtfully Designed For Your Optimal Performance And Horse&apos;s Comfort. Authentic Leather Look With The Ease Of A Synthetic Saddle. Knee Blocks Are Removable. Synthetic Wool Flocked Panels. Hose Off Saddle To Clean.